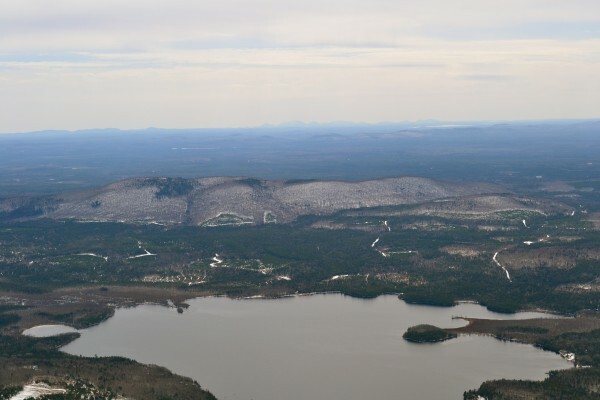 Passadumkeag Mountain is seen in this aerial photo. Saponac Pond is in the foreground with the mountains of MDI in the distance. 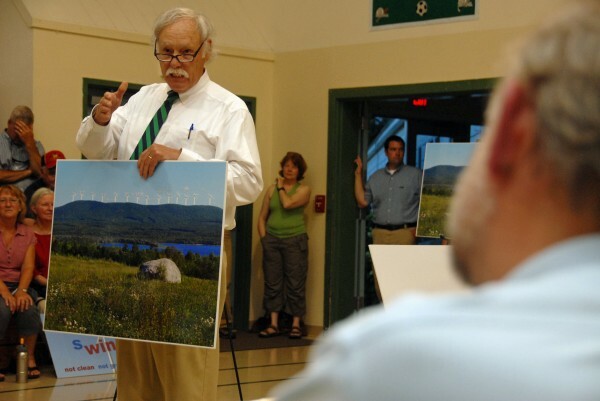 Peter Roy of Ellsworth speaks against a proposed industrial wind site for Passadumkeag Mountain during a meeting held by the Maine Department of Environmental Protection in Greenbush in July 2012. GRAND FALLS TOWNSHIP, Maine — Staff at the state’s top environmental agency recommended the denial Thursday of an application to build a 14-turbine industrial wind site on Passadumkeag Mountain, saying the windmills would disrupt a “one-of-a-kind” view from Saponac Pond. If Commissioner Patricia Aho accepts the draft decision next week, the project will be the first industrial wind site rejected by the Maine Department of Environmental Protection, spokeswoman Samantha Depoy-Warren said. The deadline for responses to the draft decision is 5 p.m. Wednesday. “It is extremely unlikely that the department would receive any information between now and next Wednesday that would change the course of the decision,” Depoy-Warren said Thursday. Attempts to contact project developer Quantum Utility Generation, an alternative energy company based in Houston, were not immediately successful. The decision echoes a verdict reached by the Land Use Regulation Commission when it rejected a First Wind of Massachusetts proposal to build 27 turbines atop nearby Bowers Mountain in April, Depoy-Warren said. In both cases, officials felt the windmills’ effect on mountain and lake views and businesses that profit from them would be too great. “The development will have an unreasonable adverse effect on existing uses and the scenic character of Saponac Pond,” the draft decision added, noting that the applicant’s materials showed that the majority of the turbines would be visible from 97 percent of Saponac. “This is a one-of-a-kind view. The project as proposed would have had a significant impact on that view. We heard that loud and clear from people who use that resource,” Depoy-Warren said. The DEP staff also found that 41 percent of the applicant’s surveys of pond users — “a substantial percentage” — said the project would have a negative effect on their enjoyment of the pond. Department officials also rejected arguments that relatively few people use the pond. “The fact that the pond may not be used by a large number of people does not diminish the importance of the limited users of the pond,” the draft decision states. “The department has made it very clear that we take a very thorough and thoughtful look at these applications. Ultimately the project passed our review on all but this one criterion,” Depoy-Warren said. The agency recommended delaying a decision on the 42-megawatt project in August to give Quantum more time to answer questions. Several residents and local business owners protested the project’s effect on the mountain and pond during public meetings held over the last six months. “We heard them loud and clear,” Depoy-Warren said. If Aho takes the staff recommendation and rejects the application, Quantum officials can appeal the decision to the Board of Environmental Protection or civil court, Depoy-Warren said, or they could revisit the idea with a substantially revised project. A First Wind subsidiary submitted a drastically reduced turbine plan for Bowers Mountain on Wednesday. Correction: An earlier version of this story contained an error. The Maine Board of Environmental Protection is not due to vote on the staff recommendation to deny an application to build a 14-turbine industrial wind site on Passadumkeag Mountain.